I have a wife and three children, and 20 years ago we surrendered our right to live in America; we sold our possessions and moved to Jordan to study Arabic. That was as far as we could see; Dawson Trotman, founder of the Navigators, said, “If you cannot see very far ahead, go ahead as far as you can see.” We were studying Arabic in Jordan in 1990 when, on August 2, Saddam’s Hussein’s army invaded the nearby country of Kuwait. We did not expect that. Oh! The commotion, the turmoil and the months of dread that that followed, and . . . “Oh!” the opportunity that opened to us. After the US retaliated against Saddam, removing the Iraqi army from Kuwait in 1991, the Kurds of northern Iraq rose up against Saddam Hussein. The Kurds, it is said, live between Iraq and a hard place. But their fight for freedom was all in vain as Saddam’s soldiers struck back, forcing Kurdish men, women and children to flee their homes. There is a Kurdish proverb that says, “Kurdu heval nînen, bas çiyaye,” “The Kurds have no friends except the mountains.” In their darkest hour, they fled to the mountains, into the snow, and up there, night after night, the old and the young were freezing to death. Then, to rescue the perishing, the United Nations created a safety zone in northern Iraq, hoping to attract the Kurds to return from the mountains. What should our team do? I proposed to my team that we move to northern Iraq. I put the proposal on the table, but it sat there like a ham at a bar mitzvah. We decided to pray until God would tell us what to do. And so we began to pray. We waited 30 minutes, 45 minutes. We wished we were Quakers and knew better how to stay silent before the Almighty. 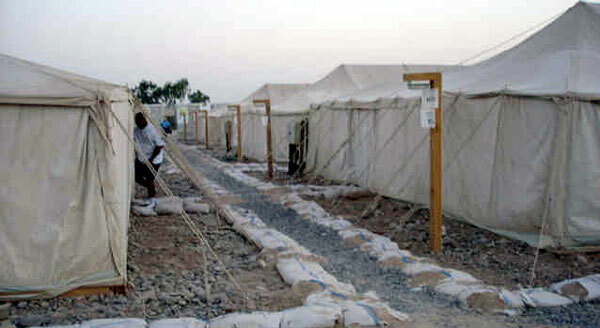 Upon their return from the mountains, the Kurds lived in U. N. "Tent Cities"
We walked down the rows of tents, and a State Department man found out we spoke Arabic; He asked us to spend the night. He gave each of us a tent, and a sleeping bag, and water to drink, and an MRE, Meals Ready to Eat (of course, to soldiers MRE means “Meals Rejected by Everyone.”) But for us it was a feast. The next morning the first refugees came down the mountain. The soldiers seated me in the registration tent, and brought in the Kurdish families. I asked he head of the household, “What is your name?” “How many wives do you have. ?” “How many children do you have?” “Where to you live?” “Walk over there to get your blankets, and your tent assignment. Next. What is your name?” All morning, all afternoon, every day; until we registered 25,000 refugees in, “tent city.” And when it filled, the soldiers built a second and a third tent city; we had 75,000 people returning from the mountains to safety. The United Nations declared this to be one of the most successful efforts to return a refugee people to their homeland; and we never got back on the bus! And when the Kurds moved back into their neighborhoods, we moved in with them. And there we lived a as a family and as a team, month after month, year after year during the 1990s.